The Japanese Maple is just starting to show its leaves. This is such a pretty tree. I have it in a corner of the side yard where it gets some morning sun. It is near the lorapetlums, and repeats the color of that shrub’s leaves. The repetition of color helps to unify the garden. These trees really cannot take our southern sun, so they need to be sited carefully. Too much hot sun can scorch the leaves. I have another one that will have to be moved this year. The taller trees that were protecting it from too much sun came down in Katrina. Last year the poor thing really didn’t do well, so it will have to be moved. I am thinking about putting that one in a container because it is small, and I really don’t have a place to put it where it will do well. In researching Japanese Maples, I found that they will do well in containers and this way I will be able to put in an area that does not have hot afternoon sun. These trees will grow just about anywhere the soil is well-drained. 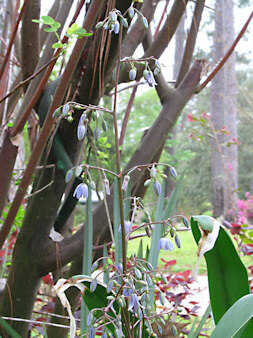 The blue bell-shaped flowers of the Flax Lily (Dianella) have just started opening up. This is the green variety. The variegated one has not started blooming yet. After the flowers fade, this plant displays blue berries that last through fall. It is supposed to be a tender perennial, but I haven’t had any problems with this in zone 8 where we had several hard freezes this year. I first saw this plant two years ago being grown in a large sugar kettle in front of a bank. It was blooming, and I couldn’t wait to get my hands on some. I was so happy when the first nursery I went to had some. That is when I bought both the green and the variegated flax lily. Last year I bought another variegated one because it adds so much to the border. This year I am going to divide them and space them around the garden. These plants do not like the hot afternoon sun. I keep mine well watered, so I have not had any problem with too much sun. Both of these plants do well with morning sun, and I look forward to the Japanese Maple’s red leaves and the flax lily’s blue flowers as spring marches on here in South Louisiana. This is the variegated Japanese Iris that I bought when I went garden nursery hopping with my sister last week. It is a little deeper purple in reality. The digital cameras do not always show the true colors of flowers. I am going to place it near my Louisiana Irises and am hopping the green and white leaves add a little oomph to that section. 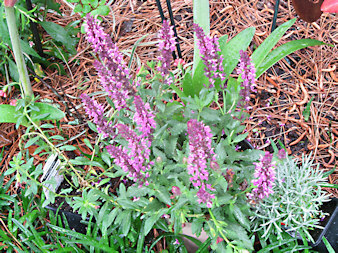 This is the Pink Friesland Salvia that I bought on the same trip. It is a very pretty purplish pink. To the right of the salvia is a small curry plant. I thought I would give it a try. When the leaves are rubbed, it gives off a wonderful curry aroma. I also was able to find another Blushing Pink Knockout Rose. The nursery only had one, and I would like to have one more to make a grouping of three. The pale pink of Blushing is just what is needed in the fuchsia/pink area to lighten things up. Phillip of Dirt Therapy has tagged me to write ten facts about me. Here are the rules – “Once tagged, you are to write a post listing ten weird, random facts or habits about yourself. Then you find 5 people to tag. Not only do you list them at the end of the post, you have to tell why you chose them. Next, you must leave a “You’ve been tagged” comment on their blog. They’ll come back to read the details. Once these good people have posted their list, they must remember to let you know. One good thing – they can’t tag you. 1 I like symmetry – there are very few asymmetrical arrangement of things that I like. Give me things that are matching pairs every time. Maybe I am just a little formal? 2 Cold pizza and orange juice is a great breakfast – drives my hubby crazy. 3 I am a very spiritual person. 4 I hate being late to anything – I don’t like being too early, just not late. 5 Green is my favorite color. 6 I love anything Irish. 7 I’ve started taking a chanting yoga class and am loving it. 8 I love big, family gatherings. 9 I have a terrible time writing on the computer – I just can’t seem to see mistakes or typos, I usually need a hard copy. Blogging has helped, though. 10 I love to have music playing in the background as much as possible. I have decided to tag Sarah at Gardener’s Gazette, Brenda at thebrendablog, Christina at Transplanted, Nancy at Nancy’s Garden Spot, and Sherry at Sherry’s Place. I am still working on putting those plants I have recently purchased into the ground. I am making progress. I have continued to clean out the border that I started on Monday. I have finished about 30 feet with about 20 more to go. Yesterday I planted a ligustrum and another white lace cap hydrangea in the section I worked on. 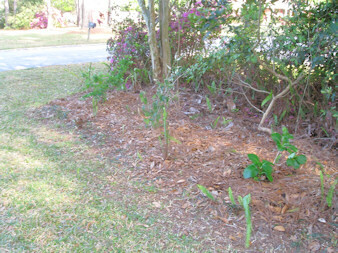 Today, I just continued to clear out the dead fern fronds and even out the mulch. I didn’t do as much because my elbow and knee were bothering me a bit. The azaleas are just about finished blooming, so I did trim back the long shoots. 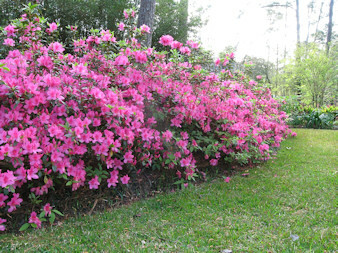 I do not shear the azaleas into a hedge; I just prune out the leggy growth and let the plants have a more natural look. This cuts down on maintenance, and I think it looks better in my garden. We have not had any rain in almost two weeks, so I did start watering. In the garden I use soaker hoses, and I do use a sprinkler for the lawn. I only watered the lawn to help it green up some. I no longer water the lawn like I used to, and I have found it does better. Last summer I think I only used the sprinklers about four times and the grass was fine. New blooms are showing up every day. The amaryllis I received from a friend last year are opening up. They are a soft salmon color, but the photo shows them a little more vibrant than they are in person. 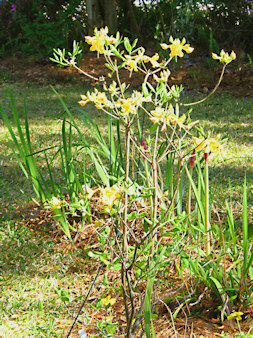 The yellow native azalea has opened its flowers also. These blossoms are a lovely light gold that continues the yellow theme in the circle garden. It is still a fairly small plant, but it won’t be long before it is bigger and really puts on a golden show. The entry garden is really starting to fill out. 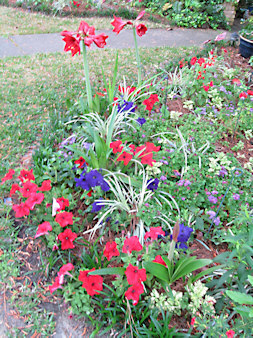 The amaryllis are opening up, the petunias, and ageratum are thriving, and the gerber daisies are now blooming non-stop. One of the signature plants of the South is the Lady Banks rose. My mother grew this climbing rose and had one in the back garden that was huge. Every spring it was covered in small, double, yellow flowers. This rose is a vigorous climber. I remember it going into a nearby tree. 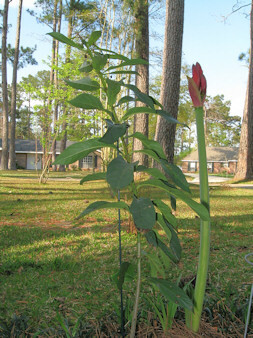 This once-blooming rose usually starts showing its flowers in early April here. I have always wanted a Lady Banks rose, but I could never find one. Then, about three years ago I found a white Lady Banks at, believe it or not, K-Mart. It had one small bloom, so I knew that it was labeled correctly. 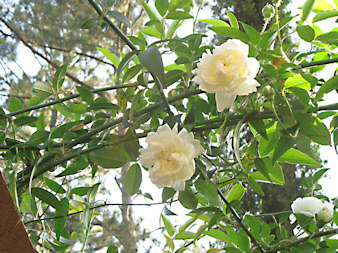 This one, too, is a once-blooming rose with small, double, white flowers. The white works better where it is placed than the yellow would, so I wasn’t disappointed I couldn’t get the same one my mother had. The white Lady Banks is not supposed to be as hardy as the yellow, but this far south, I don’t think it will be a problem. The white version also is supposed to be more fragrant, but I haven’t noticed that yet. Maybe as the rose bush gets bigger and has more flowers the fragrance will be noticeable. 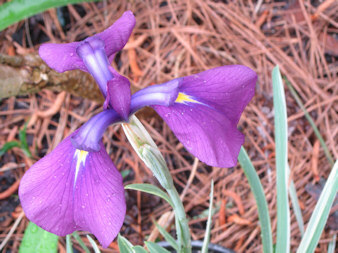 The fragrance is said to be resemble violets. This rose blooms on old wood, so it needs to be pruned immediately after blooming. One of the nice things about this rose is that it is almost completely thornless, so it does well on an arbor that people often walk under. The year I bought Lady Banks, the bloom time was over. The next year there were a few blooms, but the bush was still small. This is the first year that I have had any significant show of blooms, and I can’t wait until Lady Banks is older and puts on a big display of flowers. I have often written about my older sister and how she has been so generous in giving me plants for my garden. She is the one I go on gardening field trips with. As a matter of fact we went on one today, visiting three nurseries. That will be a post for another day. I have been encouraging my sister to start a garden blog because I think she would be good and could add to the garden blogging community. She is very knowledgeable about plants and is always reading about gardening and plants to get new ideas. I think I almost have her convinced. Here is a picture of her garden. Maybe when she sees it, she will see that she needs her own blog. This is a photo of her pond garden. The rest of her property looks just as good as this section does. Sis works hard in her garden, and it shows. So come on, Sis, join the garden blogging community. You’ll love it. Today I received a comment about cypress mulch, specifically about not using it. Being from South Louisiana, I have known for some time about the problems with using cypress mulch. With the slogan “Why kill a tree to grow a flower”, there are several groups trying to educate people to let them know that the cypress mulch that is sold today is not termite-resistant, and degrades the cypress wetlands which in turn worsens coastal erosion. Thousands of acres of cypress are harvested just to produce mulch. Very little is replanted and even if it is replanted most of the seedlings do not survive the first year. These grand trees can live to be 1500 years old and be 150 feet tall and 25 feet in girth. They are home to many birds and mammals. 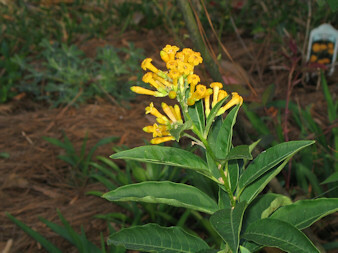 Check out this site from Florida’s Suncoast Native Plant Society. This site also tells about how cypress mulch appears to have a high water-retention ability which may reduce the amount of moisture available to plants. This site from the National Wildlife Federation explains how the cutting of cypress trees is destroying the Gulf Coast’s coastline and doing more damage which makes us even more vulnerable to hurricanes like Katrina, not to mention the devastation to wildlife (60% of all US bird species pass through the swampy forests of the Gulf Coast). 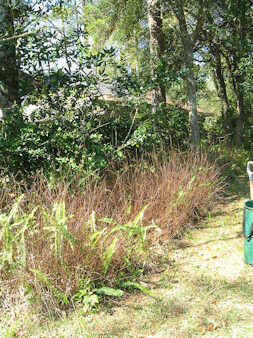 Both of these sites give alternatives for mulch for gardeners to use instead of Cypress. I believe that the statement by Bana Malik in his comment is true that “Our gardeners hold the key. We believe that gardeners must know the truth about cypress mulch, and will stop using cypress mulch when presented with the facts.” So please think twice before using cypress mulch. Today was the third day that I worked on putting the plants I have purchased in the ground. I thought I would finish today, but instead of a trilogy this is turning out to be a series. I decided that the winter honeysuckle and sweet almond shrub should go in by the property line on the southeast side of our lot. The only problem with that was the amount of overgrown material that needed to be pulled out. When we moved in, there was a row of large gardenia bushes. These gradually died because of a lack of sun from growing trees (at least that is my hypothesis). About seven years ago, I put in sword fern to fill in bare areas and give the area a more woodland look. It did very well, but by two years ago it was doing too well. It was taking over something awful. Well, fast forward to this year and the cold weather we had really helped get rid of the excess. As you can see from the picture below, there is a great deal of dead fern fronds. (At least the leaves added to the soil.) So I decided today was the day to start pulling it out to plant the shrubs. I started pulling out the dead fern clumps, and most came up easily. I also had to cut out some oak, maple, and cherry tree seedlings, blackberry vines, and briars. It is amazing how much unwanted plants can grow in a year or two. I cleared out about a fifteen foot area. Next came the digging of the planting holes. We have hard clay that is filled with tree roots. I have learned from planting shrubs before that a shovel just won’t make it. I use a post hole digger. That way I can cut through tree roots and can make a big enough hole with less effort. I did hit tree roots for every hole I dug. This makes slow going. I planted the Winter Honeysuckle (Lonicera fragrantissima) first, and then about four feet down I placed the Sweet Almond Bush (Aloysia virgata). Finally, I dug up a white lacecap hydrangea that had rooted when a branch had been bent to the ground. It had rooted last summer and now was too big to do well next to the mother plant. I placed this about four feet down from the sweet almond shrub. Already things are starting to look better. I want the area to have a semi-wild, woodsy look. The next door neighbor has some azaleas on her side which makes a nice backdrop for my side. There are some Beautyberry bushes here, and I am thinking of adding some more hydrangeas and maybe some holly ferns. Parts of this area do not get a great deal of sun, so I am going to have to figure out what should go into the rest of the area. Even thought I did not get to plant everything today, I do feel that I have accomplished a lot. An overgrown area has started to be cleared out, plants are in the ground, and I have a better vision of what to do with the overgrown area on the property line. So all that’s left is a soak in a warm Epsom salts bath to soothe my aching muscles. Since today was Easter, I didn’t work in the garden. I just walked around before we went to my daughter’s for lunch and enjoyed the beauty of nature in Spring. Some new things were blooming. 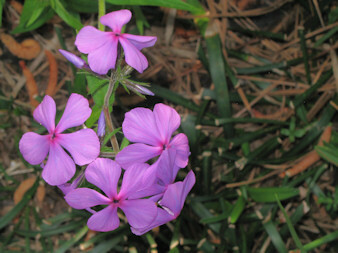 Woodland phlox (Phlox divaricata) just starting to bloom. These are great at the front of the border as an edging. Yellow Shrub Jessamine (Cestrum aurantiacum) is now blooming. I recently bought this plant for the circle garden where I have mostly yellow plants. Butterflies are supposed to love this plant. 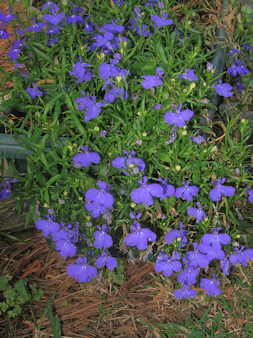 Lobelia is showing its gorgeous blue color. We grow this as a cool season annual here, since it cannot take our hot summers. It will only last until May. This row of azaleas is showing its best color now. These are at their peak just in time for Easter. Well, today was another fantastic day weather wise. Cool, breezy, and sunny. The perfect day to work in the garden. More and more plants are popping up and showing blooms. One of the daylilies I received from Oakes Daylilies already has a bloom, as does one of my January Wal-Mart purchases. 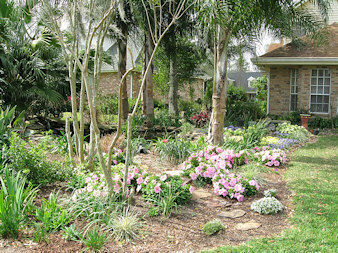 Also showing blooms are woodland phlox and a yellow native azalea. I continued planting the container plants I had bought but never planted in the ground. At the fall garden show in New Orleans, I bought a Turk’s Turban (Clerodendron indicum), and that was the first thing I planted today. It went in at the side edge of the entry garden away from the walkway. It gets rather large, but I may keep it trimmed into a small tree. In late summer or early fall it puts out fragrant, white flowers that have bright red calyxes that last through the winter. 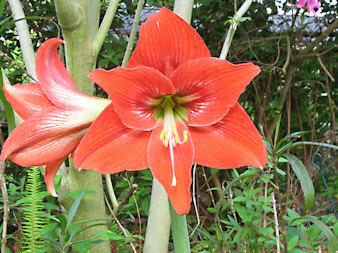 Turk’s Turban finally planted in the garden next to red amaryllis. 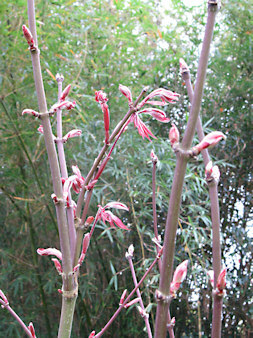 Next on the list was a Coral Bean tree (Erythrina x bidwillii). This, too, was purchased at the same garden show. 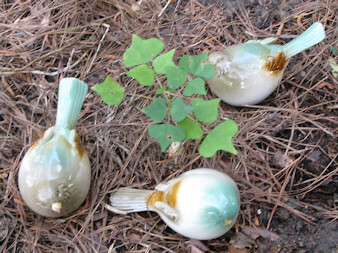 I also put this in the entry garden because it will have bright red seed pods. Since my color scheme for that garden is red and purple, I figured I would try it there to repeat the red color. This is a very small plant, but from my experience with a Crybaby Tree, I know it won’t be long before it is a small tree. Coral Bean tree surrounded by guardian birds. Another plant purchased at the fall show was Pinecone Ginger (Zingiber zerumbet). This I planted in the back garden where it will be in partial shade. It is totally dormant right now, but it should be starting to show growth soon. My Hidden Ginger (Curcuma alismatifolia) is also dormant at this time, but I am sure it won’t be long before that, too, is up. These gingers seem to be some of the last to show in the spring. They are not like the other gingers I have. The shell ginger (Alpinia zerumbet) wasn’t even nipped by the frost, the variegated shell ginger was frost damaged but has already sent up shoots, and the butterfly ginger (Hedychium coronarium) is about two feet high now. The reason that I didn’t plant these when I bought them in September was that I was unsure if they would survive the winter. Because the plants were small, and I didn’t know how severe our winter could be, I opted to keep them in their containers until springtime. I did plan on planting more today, but for some reason there is a person in this house who likes to eat, so I had to go to the grocery. With it being a holiday weekend, of course, it was very crowded, and everything took longer than usual. So with still more to plant, it looks like this posting is going to end up being a trilogy.